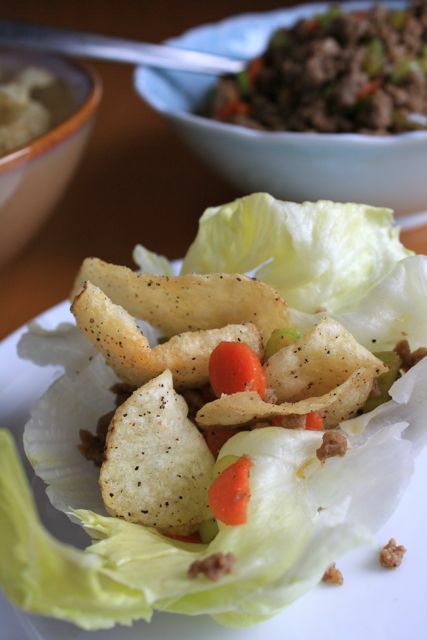 Lettuce wraps with ground pork and potato chips spilling out of them are not exactly romantic things to photograph. It's hard to get any light into the pork, the lettuce looks whiter than it actually is and the chips make it look like some kind of sea creature from outer space. 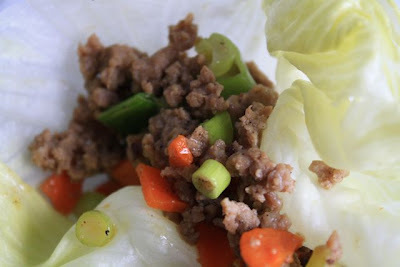 I have actually been working on Chinese-Canadian lettuce wraps about seven years now. 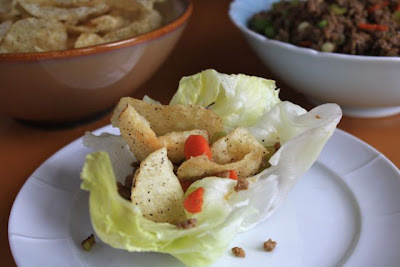 With a salty-peppery crunch and bits of tasty ground meat attempting to escape, I bit into my lettuce wrap. I was – immediately, irrevocably – converted to putting potato chips in my lettuce wraps. And that is how we've eaten them ever since. I do believe Virginia used ground chicken or pork (considering I didn't eat red meat at the time). 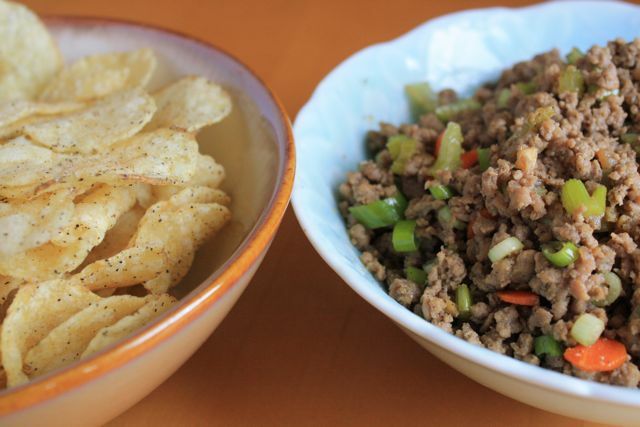 But we've now settled on ground pork mostly because eating ground pork reminds me of the Chinese pork and chive dumplings that I LOVE so much I put the word in all-caps. In fact, the ground pork marinade here was inspired by the excellent Mark Bittman's recipe for pork pot stickers. Dress the pork a bit and fry it, then fry up some carrot and celery. Throw it all in a lettuce wrap. Use your artistic talent to wedge in some curly potato chips. Eat. And now for some exclamation marks: I can make these in 35 minutes! Alone! Without a sous-chef! So can you! 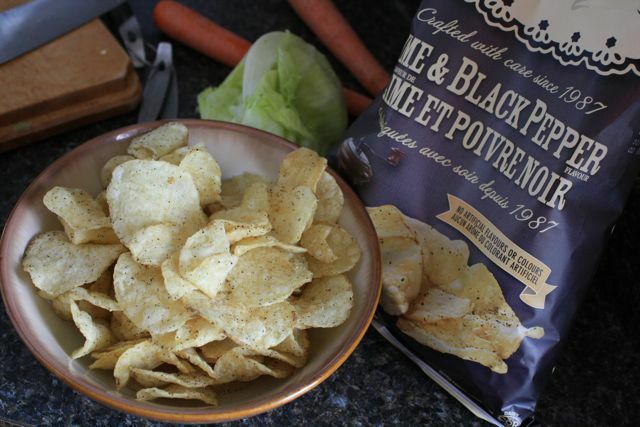 Eating potato chips for the main part of your meal is fun! One bite and I proved him wrong. This pork is so moist and well-seasoned with a kick of pepper and sesame oil (not to mention the pepper on the potato chip), that you really don't need any extra sauce. Which is awesome. Because it means less mess and less dishes and in case you didn't hear me the first time, you don't need sauce. 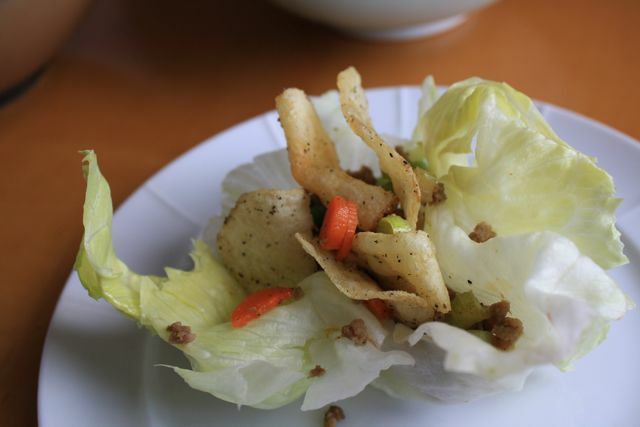 I call these Chinese-Canadian lettuce wraps because I checked and Virginia didn't put potato chips in them in Hong Kong. Instead, she used deep-fried mong bean noodles for crunch (which also sounds pretty fantastic). So this is Vancouver Chinese fusion food at its best. Yum. In a medium bowl, mix ginger, rice wine vinegar, soy sauce, sesame oil, sugar, pepper and salt together. Stir in the pork; try to coat it as best you can. Heat a heavy-bottomed frying pan or Dutch oven over medium heat. Fry the pork, stirring often and breaking up larger chunks, until it's cooked through, about 8 minutes. With a slotted spoon, put the pork in a bowl, leaving whatever small bit of liquid is left in the pan. Turn the heat down to medium-low. In the pork pan, fry the celery and carrots until they have slightly softened, but are still tender-crisp, about 8 minutes. Remove the pan from the heat. Stir the pork into the celery and carrots and mix well. Stir in the green onion. Serve pork mixture with lettuce leaves and potato chips so that everyone can make their own. Aw shucks -- thanks, Robin!